Where There's A Wheel, There's A Way. Where There Are 2, Things Can Get Weird Boneshakers, gunshots and "hygienic saddles": Cycling's history is littered with oddities. With the Tour de France in full swing, journalist A.J. Jacobs offers some choice nuggets of bike trivia. 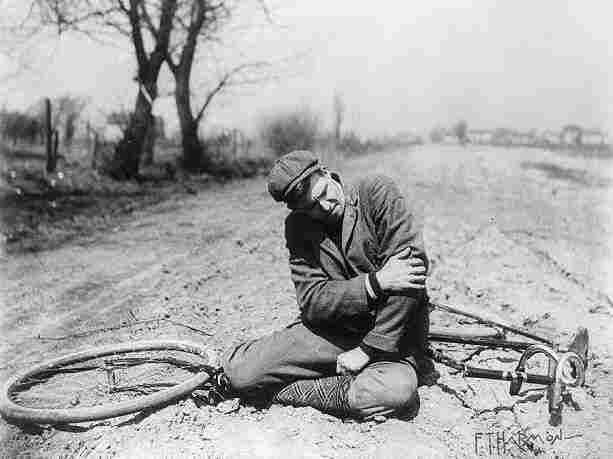 A rider nurses his elbow, and his pride, after a fall. Bicycle riding was rough in the early days — but this gentleman was lucky. He could have been on the Tour de France, where competitors busted their wheels on broken glass thrown by rowdy fans. This week, Tour de France riders cranked through three grueling days in the Pyrenees mountains. Once more, they've all made the curious decision not to just get off their bikes and take a bus like sensible people. Be that as it may, the Alps are still to come, and there's plenty of pedaling to go before they sprint into Paris on July 26. So, while fans await that triumphant homecoming, there's no better time to turn to know-it-all journalist A.J. Jacobs. He takes NPR's Scott Simon on a tour of their own, talking trivia with a bit of bicycling lore. I'm sure it was very entertaining if you didn't get shot. The first bikes in the 1860s were called boneshakers. So they had an iron frame, iron tires. They weighed more than 40 pounds. And you were riding them over cobblestone. So it was not for the faint of heart or, as they said back then, the faint of derriere. Cycling was actually a huge part of the women's movement. And Susan B. Anthony said that bicycling has done more to emancipate women than anything else in the world, because it gave them freedom to move around. And it helped them get rid of those huge, flowing dresses. But there were men who thought it was a grave threat to women's sexual purity. And so they designed what they called the "hygienic saddle," which was an uncomfortable seat that would keep women properly chaste. So we can thank these guys for saving Western civilization. She was a Jewish mother of three from Boston. And in 1894, because of a bet, she decided to ride around the world on her bike in 15 months. And she went off with a pearl-handled revolver, a change of underwear. She did it. She was thrown in Korean jail, [but] she did make it. There is a wonderful book about it called Around The World On Two Wheels. She also became a huge flashpoint for women's rights because she started wearing men's clothes by the end. Apparently, one spectator saw her in pants and ran screaming.